Tired of the same ol’ burgers and beer? 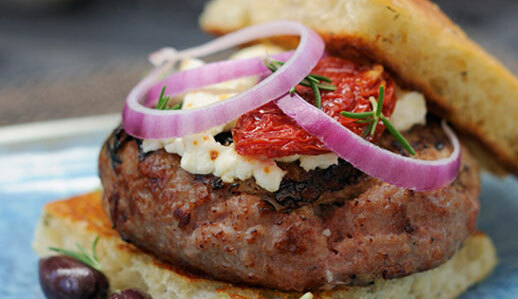 Red wine is the marinade as well as the wash for grilled burgers topped with Organic Valley’s blue cheese crumbles. Top each burger with a slice of onion, if you like—grilled or raw. 1. Gently mix meat, onions, salt, and pepper, then use a light touch to form the mixture into six patties. To prevent the “puffy” effect that occurs when burgers are cooked, make a one- to two-inch indentation in the center of each raw patty. Place patties in a single layer in a shallow dish. Pour wine over burgers; marinate in refrigerator 1 or more hours, turning occasionally. 2. Bring meat to room temperature while you prepare charcoals or an outdoor grill. Remove burgers from the marinade and pat them dry with paper towels. Grill burgers to desired doneness. During the last few minutes of cooking time, portion the blue cheese onto the burgers. Also, butter the buns and toast them lightly on the grill. Place burgers on buns and serve immediately.